Fire Hose Reels – Reelcraft Industries, Inc. Inspected on a monthly and yearly basis, fire hose reels must be manufactured to comply with national standards and safety regulations. Fire hose reels are intended to give easy access through the fire hose from water supply in order to stamp out fires. Fire hose reels typically come in three main types: grounding, booster and large diameter, all of which feature an increase hose capacity than typical hose reels. Generally made from canvas or other synthetic materials, fire hoses come in multiple types as well, including booster hoses or collapsible hoses, also known as flat hoses. Fire hoses are intended for use when fire extinguishers fail. Typical applications that require fire hoses include fire fighting and fire rescue operations in hotels, school buildings, shopping malls, houses, warehouses, hospitals and office buildings. Industries that benefit from fire houses include construction, industrial, commercial, retail, residential, agriculture, automotive, military and conservation. Firehose reels differ from other hose reels because they are built larger and more rigid to support the extra length and load. In addition, fire hose reels have a unique ball valve shut-off device, a plastic or solid brass hose reel nozzle and mounting bracket. The ball valve shut-off device enables the fire hose to provide the maximum water flow possible in one quick movement of the lever. The plastic or solid brass hose reel nozzles are heavy-duty and allow the operator to control the water flow as well as its direction. The mounting bracket allows for fire hose reels to be mounted; typically on walls or on the back of fire trucks. Grounding fire hose reels are particularly meant to be mounted on the back of a vehicle and to connect the fire hose to a grounded water supply source. Booster fire hose reels are meant for booster hoses, which can provide water flow while still on the firehose reel as well as being lightweight enough for one operator to control. Large diameter fire hose reels are for hoses with a diameter of 3.5” or more and are commonly used because large diameter hoses are used for supply lines. Collapsible or flat hoses are advantageous in their ability to be pre-connected to the fire hose reel as well as being able to fit a larger diameter hose in the same amount of space. 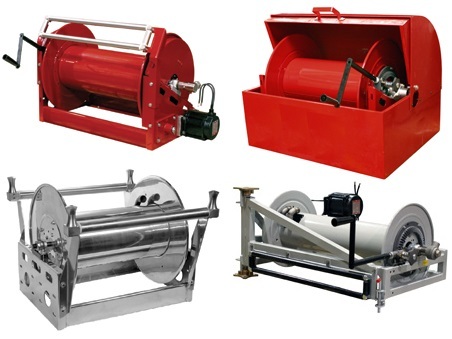 Fire Hose Reels Fire hose reels are cylindrical devices around which fire hoses can be manually or mechanically wound. Designed to combat potential class A fire risks, fire hose reels enable reasonable access to a controlled supply of water. The typical length of a fully extended fire hose is anywhere from 18 to 36 meters with diameters ranging from 13 to 19 mm. In addition, fire hoses are specially constructed to deliver at minimum 0.33 L of water per second.